Had Dan & Harriet's wedding on Saturday. Both are friends from college, the service & reception encapsulated Dan & Harriet & their trust in Jesus. That night I went to Jimbo's bucks. He is also a mate from college. We had Korean BBQ for dinner & then went to the Paramatta vs Canberra game. 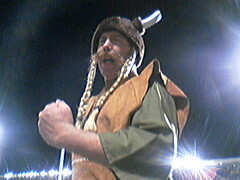 Jimbo is a big eels fan, unfortanately for him, he was dressed up as a Canberra Raider! # Dan & Harriet's wedding. # Dan & Harriet, good rest together. # Jimbo & Viv - getting married Sat 14th April.